For the LA bae in all of us. 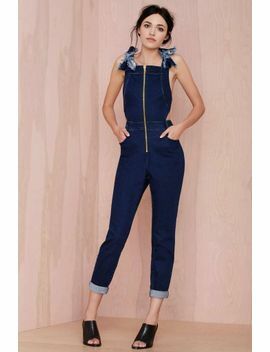 The LA Attitude Jumpsuit from Three Floor is made in a dark wash denim and features back cutout, bow embellishment with fray detail, classic five-pocket design, and cuffed hems. Exposed gold zipper at front, unlined. Killer with strappy heels and a velvety red pout.